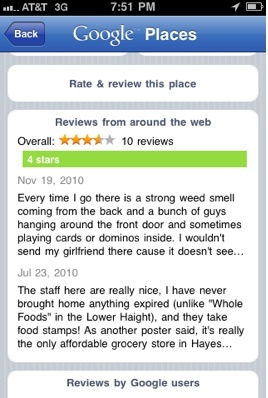 Google Places is at it again, brazenly borrowing reviews from Yelp. But this time it’s in their iPhone app and they are not even bothering to link back to Yelp or attribute where they are getting the reviews. Yelp and Google have a love-hate relationship. Yelp loves when its listings and reviews show up in natural search results, but they hate it when Google scrapes their reviews to populate its own local listings in Google Places. This tension between the two has been playing out for a long time with various ups and downs. It’s become a running joke. But Google appears to be pushing the boundaries of what is acceptable once again with its mobile app. Here is what appears to be going on based on a handful of spot checks in the Google Places iPhone app. For many places such as restaurants, Google Places offers “Reviews from around the Web” in its iPhone app just like it does online. 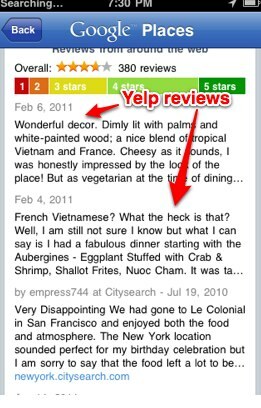 The difference is that the reviews from Yelp are no longer identified as such and there are no links either. 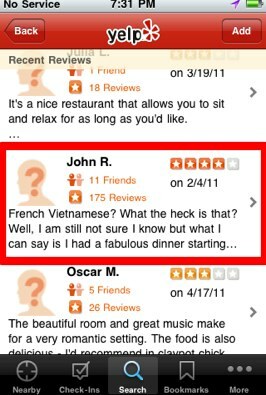 For example, if you look up Le Colonial restaurant in New York City, the top “Reviews from around the Web” are two Yelp reviews properly identified with links In the mobile app, there is no attribution or links (see screenshot at right). Yet there are links and attribution for reviews from other sites such as Citysearch. Every time I go there is a strong weed smell coming from the back and a bunch of guys hanging around the front door and sometimes playing cards or dominos inside. . . . The staff here are really nice, I have never brought home anything expired (unlike “Whole Foods” in the Lower Haight), and they take food stamps! These do not appear to be isolated incidents. Does Google Places really need to stoop to that level? Here are two more screenshots that show the pilfering. And note that reviews from other sources in the iPhone app link back to those sites, whether it’s Citysearch, Opentable, or Zagat. 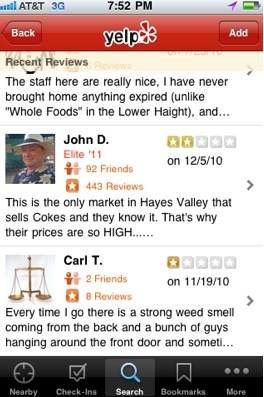 What’s so special about Yelp that they get treated differently?